Times can be tough for a young person in today’s generation. Challenges are inevitable and we don’t really know how our youth of today are going to handle diversely difficult situations. From 15 years old to 21 years of age, the only thing separating them from a successful year in school and a tragic one is how they were prepared mentally, spiritually and emotionally to weather these storms. School is supposed to be and should be a place where both students and staff can be excited to learn and experience new opportunities. A place to advance and excel in education as well as growing in healthy relationships for the future. This is where we want to come in and help you Refocus your students, Re-energize your staff, and Reposition your faculty to remember the things that matter the most. We are all human and we sometimes make mistakes! It’s how you handle pressure, failure and crisis whether in the home or in school. Your value as an individual was given to you as a gift. When your students feel better about themselves, they will perform better and embrace change. Let Jairrod help in restoring their self-worth and confidence with a 40 minute- 1 hour Impact Session. How they see interact with both staff and peers is a direct result of how they see themselves. 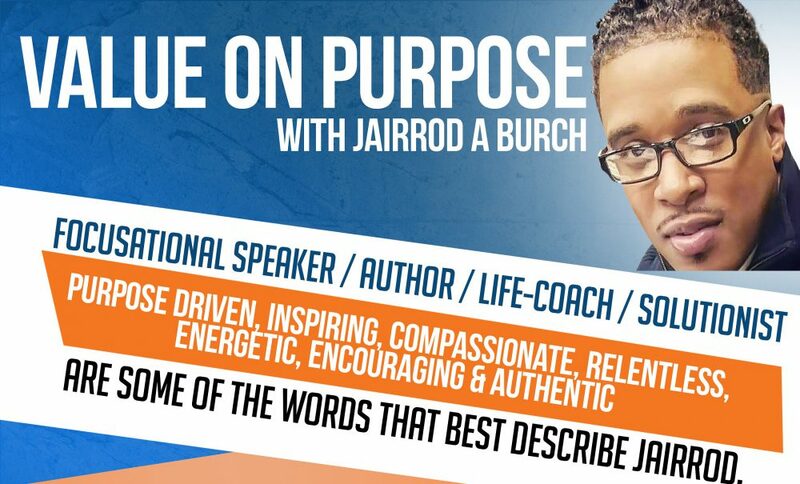 Jairrod will Inspire, Encourage, and Refocus them on the things that truly take priority. Establish sound core values in how you treat others and the way you make positive changes to better those around you.